After the smashing success of her first store, Nikkiâ€™s Uncle Ross wants her to open up a new supermarket in sunny Tinsel Town! 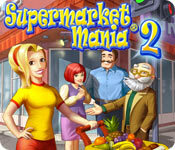 Travel to the other coast and help run the perfect grocery store in Supermarket Mania 2! Watch out for the evil Assistant Torg and his diabolical robots in this fun and exciting Time Management game. Can you repeat Nikkiâ€™s success, or will your store end up in shambles? It's Nikki`s first day of work at TORG Corp., a supermarket run by robots. She`s a bit on edge. Step in and help her stock shelves to the rafters to keep customers happy. Nikki must stay on her stylish toes and clean spills promptly, otherwise the rival superstore will shut your store down. 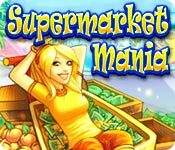 Enjoy 50 manic, yet fun-filled levels in Supermarket Mania, everyones favorite one-stop shop. Gourmania 2 serves up a smorgasbord of Hidden Object fun as you manage quaint cafes in three locations around the world! Clean up cluttered storefronts, repair broken down bars and outfit your restaurants with the finest furnishings available as you prepare for your grand openings. Then find the ingredients for the meals your customers order and prepare a feast fit for a king! Flashback to the neon-soaked 80s and help Jill prepare for the biggest night of her young life in Cake Mania: To the Max, a fun Time Management game! Like most high school students in the Bakersfield High Class of ‘89, Jill doesn’t have a clue as to what she wants to do with the rest of her life. As she fretfully contemplates various schools and career paths, her Grandpa presents her with the opportunity of a lifetime – design the centerpiece cake for her upcoming prom! Return to Jill Evans’ hometown of Bakersfield in Cake Mania: Lights, Camera, Action, a fun and exciting Time Management game! Now an attractive and quaint tourist destination bustling with new stores, Bakersfield has caught the eye of Hollywood producers scouting locations to film their next big action blockbuster. As production gets underway, Bakersfield is overrun with all-new eccentric personalities determined to mix and mingle with the locals. Do you suffer from Recyclomania?! Build your own recycling plants and become a recycling master in this incredible Match 3 game! Katie and her environmentally aware friends Joey, Emi and Steve are truly resolved to keep on recycling until they build recycling plants for all types of recyclable waste. Start off collecting glass, metal, paper, and plastic waste to win new products that help you cure your Recyclomania! While recovering from her great time-travelling wedding adventure, Jill Evans receives word that her hometown of Bakersfield has rapidly turned into a ghost town! The once vibrant Main Street of Jill`s youth has suffered an economic downturn after Baker’s Corner, a corporate super-mall, opened nearby. Help Jill and her closest friend’s save Bakersfield by using your Time Management skills and open four unique downtown shops in Cake Mania Main Street! Ice Cream cafe magnate Henry Rich is dead, and the family is at war over his fortune. In order to receive their inheritance theyll need to complete a task. Each daughter must start her own business from scratch. The daughter who builds the most profitable business over the course of a year will inherit Henry Rich's entire fortune. Help Cindy win the competition in this delicious time management game. Will she become the next Ice Cream Mania magnate?